While Leonardo da Vinci is best known as an artist, his work as a scientist and an inventor make him a true Renaissance man. He serves as a role model applying the scientific method to every aspect of life, including art and music. Although he is best known for his dramatic and expressive artwork, Leonardo also conducted dozens of carefully thought out experiments and created futuristic inventions that were groundbreaking for the time. His keen eye and quick mind led him to make important scientific discoveries, yet he never published his ideas. He was a vegetarian who loved animals and despised war, yet he worked as a military engineer to invent advanced and deadly weapons. He was one of the greatest painters of the Italian Renaissance, yet he left only a handful of completed paintings. 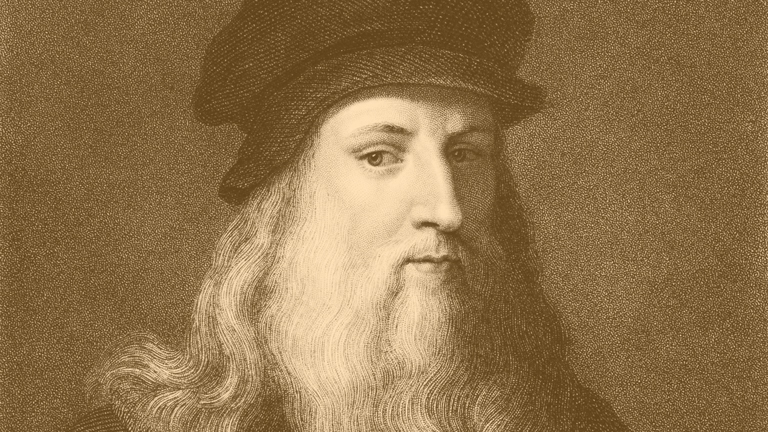 Navigate this website to learn more about Leonardo's brilliant and imaginative mind, and the art, inventions, and discoveries that he made. Leonardo sought a universal language in painting. Using perspective and his experiences with scientific observation, Leonardo tried to create faithful renditions of life. This call to objectivity became the standard for painters who followed in the 16th century. Throughout his life, Leonardo had brilliant and far-out ideas, ranging from the practical to the prophetic. Leonardo recognized that levers and gears, when applied properly, could accomplish astonishing tasks. Da Vinci bridged the gap between the shockingly unscientific medieval methods and our own trusty modern approach. The sheer range of topics that came under his inquiry is staggering: anatomy, zoology, botany, geology, optics, aerodynamics and hydrodynamics among others.